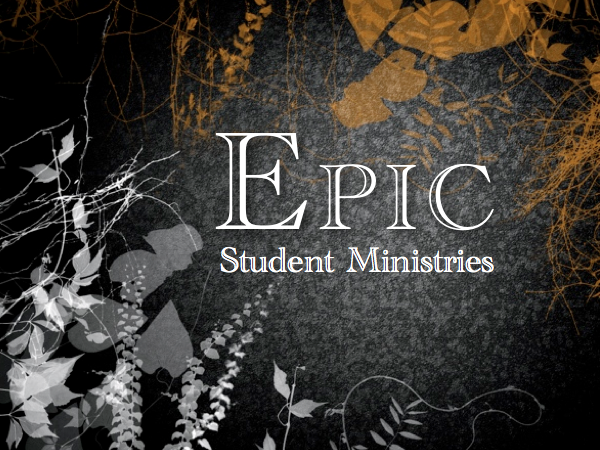 Epic is no ordinary Student Ministry! In fact, there is nothing ordinary about Epic Student Ministries! 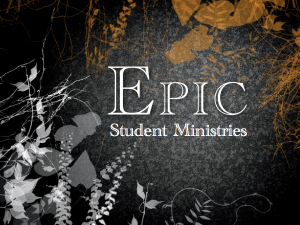 Epic Student Ministries seek to develop fully devoted followers (disciples) of Jesus Christ who exhibit an Epic commitment to their faith in Jesus Christ, an Epic commitment to living that faith out in their daily lives and an Epic commitment to making Jesus Christ known to those around them. Students are encouraged to build lasting relationships with each other and with the Epic leadership team which will help them navigate the treacherous waters of being a teen in our 21st century culture. Epic Connect Groups are not your ordinary Sunday School Classes! Sundays 10:00 – 10:45 AM (Downstairs in the Family Life Center): Creative and practical Bible based teaching at its finest! The Epic Experience is no ordinary gathering of students! Wednesdays 6:30 – 8:00 PM (Downstairs in the Family Life Center): Principle driven Bible study, followed by “life application” small group time to discover and discuss life applications of biblical principles in greater detail and with more focus. Although the organized and planned student activities on Wednesday night end at approximately 8 PM, many students like to stay and enjoy our gymnasium facilities or our other student resources available until their parents are ready to leave. Throughout the year a number of other activities are offered to provide an ongoing, well rounded approach to ministering to every facet of a student’s life. These include: Impact: Student Leadership Camp, mission projects, ministry projects and regularly scheduled recreation based events.